M is for Magicians' Guild, the presumed training center for all magic-users (and elves) in Karameikos. Magic is a tricky subject for this series, as every edition of Dungeons & Dragons places its own stamp on the subject, each doing things a little different from the other. GAZ1 (which is the origin of the Karameikos "Magicians' Guild") is written for the BECMI edition of D&D, and while superficially similar to B/X, there are some changes. Before we look at the Guild proper, it's important to understand these differences. A magic-user in BECMI is "a human character who studies the powers of magic. 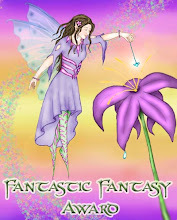 Magic-users find spells, put them into books, and study those books to learn the spells." In BECMI, "learning" is the term used for the process most D&D editions (including B/X) call "memorization." A magic-user "learns" his or her spells after a good night's rest and hour's study; casting spells causes them to be erased from the magic-user's memory, necessitating the magic-user "re-learn" the spells. All BECMI magic-users begin with a spell book of uniform size containing TWO 1st level spells; the spells known are chosen by the Dungeon Master. Upon reaching 2nd level, a third (1st level spell) is added to the book; again chosen by the DM. Upon reaching 3rd level, a single 2nd level spell is added; upon reaching 4th level a second 2nd level spell is added. The game assumes these spells are given to the magic-user by a teacher of not less than 7th level of experience (hence, the reason the DM chooses the spells). Teachers do not go on adventures. Any magic scroll containing a magic-user spell may be added to the magic-user's spell book, so long as it of a level that the magic-user can cast. Doing this uses up the scroll, but provides the magic-user with a wider range of spells to be "learned." The read magic spell is required to read magic writings (including that of scrolls), unless the writing is the magic-user's own (i.e. of the character's spell book). A magic-user may research new spells of any level they can cast; expending the proper money and time allows the magic-user to add the new spell to his or her spell book. 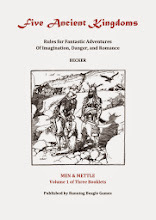 There is no listed chance of failure for spell research but (strangely) Mentzer's Companion set makes provisions for a wandering wizard being able to "double the chance of success" when assisting another mage with spell research. Magic-users in B/X are "humans who, through study and practice, have learned how to cast magic spells." All magic-users start with ONE spell at 1st level in their spell books, and gain additional spells as they rise in experience. In B/X, the DM "may choose which spells a character has in the book, or may allow the player to select them." 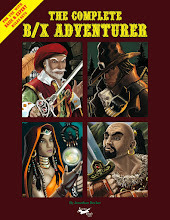 In B/X, magic-users must be taught their new spells, and characters are "assumed to be members of the local Magic-Users Guild or apprenticed to a higher level NPC." When a player character earns a level of experience "they will return to their masters" and will be out of play for one "game week" while learning new spells; either the player or the DM may choose the new spells. Importantly, in B/X magic-users "are limited to the number of spells they may know, and their books will contain spells equal to the number and level of spells the caster can use in a single day." There is no mention of magic scrolls being added to a character's spell book, and while magic research is performed the same, it does not seem to break this explicit limitation (instead just giving magic-users another way to acquire spells outside their "Guild"). Reversible spells are, however, simply memorized "backwards," allowing magic-users who have such spells to effectively double-up on their magical knowledge. B/X is thus the most restrictive of any edition in terms of learning magic: it allows the fewest number of spells to be cast (by level) of any edition, and the spell selection is limited to those exact spells. Furthermore, it is the DM's choice whether or not the player has any say in which spells are learned. "No your guild doesn't want you to learn fire ball...here take water breathing instead." This is iron fisted role-playing folks, but it gives DMs a lot of explicit control over the shape and form of the B/X campaign setting. 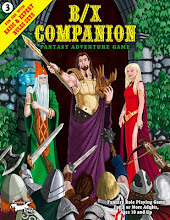 Back to Karameikos: GAZ1 provides a Magicians' Guild in the form of Teldon, a 110 year old Thyatia adventurer who settled in Karameikos 30 years ago at Duke Stefan's request where he was "badgered by Thyatian and Traladaran youth to share his knowledge and eventually created the Magician's [sic] Guild of Specularum." The guild is nothing more than a decorated tower (Teldon's residence) attached to a barn-sized building that acts as the guild's school and laboratory. Teldon is a 15th level magic-user, and while his spell book is extensive, it IS limited, especially with regard to high level spells. This limits the spells accessible to most (BECMI) magic-users in a Karameikos campaign...although they can find other ways to acquire spells (like pursuing spell research or bargaining with Bargle the Infamous). The set-up in GAZ1 doesn't work particularly well as written for a straight B/X campaign. The nice thing about a B/X's limitations is that it encourages players to specialize somewhat...possibly even with a focus on theme (illusions, transformations, fire magic, etc.). Unfortunately, this can only occur when there are multiple sources from which to learn one's magic...a single instructor, like Teldon, can only teach the spells in his own repertoire. And in a B/X game, that repertoire is extremely restricted. While BECMI magic-users learning from Teldon's "guild" have a large number of choices as to what they put in their spell book AND what they choose to memorize for the day, B/X magi will (eventually) end up being cookie-cutter copies of each other, which I find to be both lame and uninspiring. Woke up to the news of Notre Dame burning, and it was quite a shock. To the topic at hand, BECMI Basic DM book page 19 does have a paragraph on replacing lost spell books. It doesn't give specific guidelines, but does tell the DM to make it difficult/expensive but possible. "the magic-user or elf must remain out of the campaign [until the spell book is replaced"
I use the strict B/X rules in my campaigns and thus I require, like you said, a number of magic-users and elves that can teach people new spells. Which is why I've started my "spellcasters" project. It's still work in progress, but there are already quite a number of these spellcasters with their spellbooks available. Ha! I have my own little "spell caster side project" I was mulling over (thought must be going around these days). I'll be sure to check yours out! "Teachers do not go on adventures." My first D&D groups played BECMI back in the early 90's, and we were *baffled* by the rules for learning or acquiring spells. (We were also, you know, elementary school students.) We ended up picking up the rules from AD&D 2nd edition, but then back then we just sort of used things from BECMI/AD&D2 in an unholy mishmash. So nice to see your comment, man...almost dropped you a comment in an old post (on your blog) a couple weeks back, but decided the best way to entice you was to just keep throwing content up here. Like spackle. BECMI (the basic set) *is* organized a little strange, certainly compared to other edition rulesets. I always have trouble searching for things in the players book, just because the pattern of info layout is so different from other sets. I think a real effort was made to make it a teaching manual for the complete novice (like explaining classes before explaining character creation), but then efforts to make it a useful reference (adding class rules in the class section prior to explanations, putting spells with each class rather than a separate magic section, sticking charts and tables right in the middle of everything for ease of finding), just ends up confusing things. All to say, I'm not surprised by the "bafflement." There's no wizarding that goes on in the CYOA examples (though the sidebars later on aren't terrible), and perhaps that would have helped. Or just more straightforward writing. Or maybe a helpful parent. I don't know. Content draws me like flies to a scaphism victim. I'm working on a little White Box FMAG project, but I haven't blogged it yet.